Jack Gantos Day here in the entwood. I have been unabashed in my fandom for this man's writing. The humor in his books got my family through a tough time. 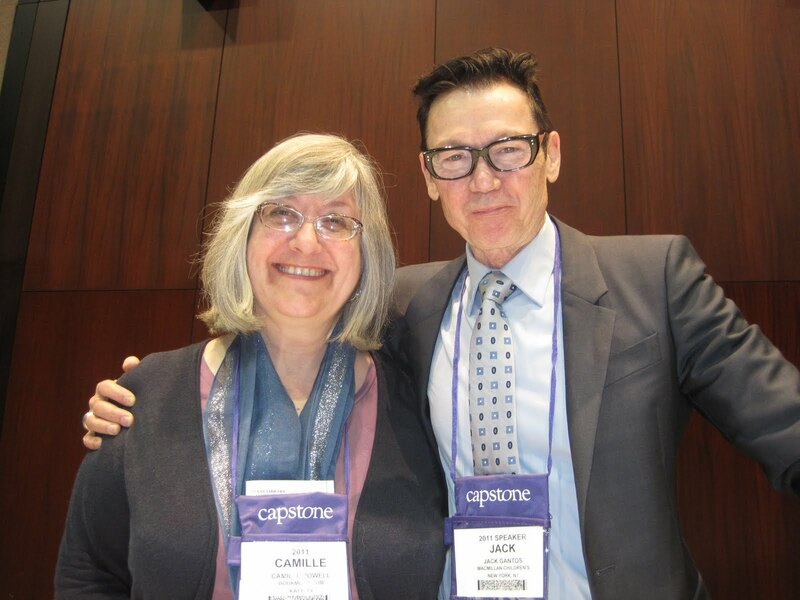 I still hear from students (many now in college) who say, "I remember when Jack Gantos came to our school." His visit was memorable in so many ways, not the least because it was the first and only time I ever saw a teacher almost fall off of her rolling chair because she was laughing so hard during his presentation. One of the many joys of belonging to the Kidlitosphere community is getting to know folks who share your reading (and felt boarding) enthusiasms. During an email discussion of all-things-Jack with Jules at 7-Impossible things Before Breakfast and Adrienne at What Adrienne Thinks About That, we all agreed that Gantos would be the PERFECT choice for the role of Ambassador. So today, along with them, I enthusiastically wish to nominate Jack Gantos to be the next National Ambassador for Young People’s Literature. His knowledge of children's literature is "deep and wide" as the old song goes. Listening to one of his presentations is a mini course on the subject. From Rotten Ralph to Hole in My Life , his books span early childhood to young adult. Gantos's stories takes his characters into the strange, the odd, and the macabre but he always knows exactly how far to go and respects the youngster holding the book. He overlays his stories with tenderness and affection. Still, there are moments when the reader cannot believe what just happened. While reading his stories aloud, my listeners have been know to suddenly cover their eyes (not their ears) and exclaim, "I can't watch!" It is fitting that after years of writing some of his childhood into the Jack Henry stories, his character has stepped out in Norvelt as "Jack Gantos" or "Gantos Boy." I hope Jack can be considered for ambassador. He would be grand. Thank you Jules for arranging for our t-shirts. I wear mine with pride. You guys are so cool!!! What a fab idea! (I love his glasses; for those alone he should at least have a shot at the ambassadorhood). I really hope this works. 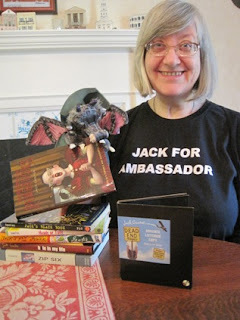 I love your pics and you in your shirt, but I particularly love the picture of you and Jack. I wore my shirt to the YMCA and am still wearing it. I want a stranger to ask me who Jack is. It would just be fun to answer. Lovely fun stories. Thanks for sharing them. 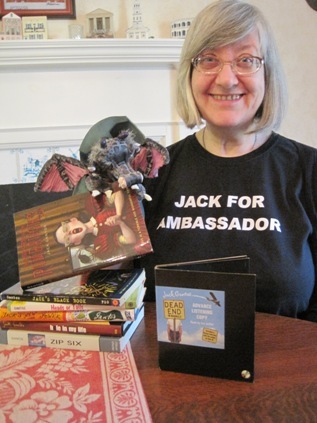 So, one person asked me today who Jack was. And I got to say. Jules: That is really fun. 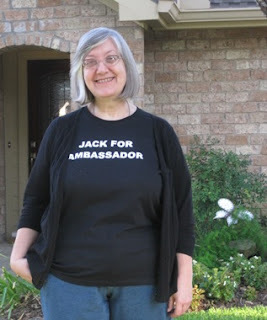 Think I will wear mine to the TX Book Festival. He really is very funny. I got to see him last August at our children's library-type people conference. We were all laughing SO hard. Most importantly, he is a very good storyteller.